Olives, almonds and summer truffles imaginatively brought together by a high quality oil. An exceptional product which is certain to appeal to everyone. Once you have tasted it you won’t be able to resist finding new ways of savouring it. 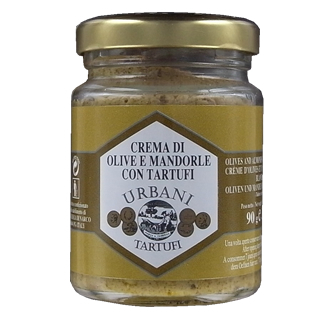 Use: Ideal for toasts and starters, hot pizzas and as a seasoning for pasta. Ingredients: green olives, almonds, extra virgin oil, summer truffle 1%, acidity regulator GDL. Shelf life: 3 years after packing.